Donkey Kong Country 3: Dixie Kong's Double Trouble (800 Points): Revisit Donkey Kong Island and join the Kong family for their latest adventure. The Kremlings have a mysterious new leader named KAOS and are up to their usual mischief, even capturing Donkey Kong and Diddy Kong. Now it's up to Dixie Kong and the newest Kong, a giant infant named Kiddy, to rescue the two missing apes. They'll travel across previously unseen parts of the island in their search, and even take to the skies in a rocket at one point. Lucky for them, Dixie and Kiddy's powers complement each other (including Kiddy's talent for rolling like a barrel), so they form a powerful team capable of major Kremling damage. They're not completely on their own, either, since returning favorites like Funky Kong and Enguarde the swordfish provide help along the way. And in a series known for its abundance of secrets and high replay value, this entry doesn't disappoint, with enough hours of game play to satisfy Donkey Kong himself. Anyone else have a sudden urge for some bananas? 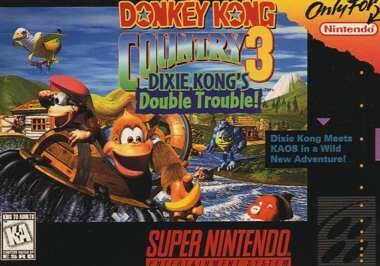 Why not add Donkey Kong Country 3: Dixie Kong's Double Trouble to your collection, and indicate that you are currently playing it? And don't forget to rate it when you're done! Mention whether you're playing on the SNES or GBA when you start discussing the game. I suppose I'll have to buy it up and play it. I remember borrowing my cousin's copy and playing it way back in the days, wasn't super impressed then but who knows what I'd think now. YAY! I will be hooking the SNES up for this one. It's been too long. EDIT: Also, I'll be playing the original Super NES cartridge. I just beat that belching barrel, and I'm pretty sure I've found everything so far along the way, except for that pricey mirror. It's slower than DKC2 or DKCR, but I'm having fun nonetheless! 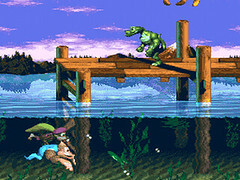 One thing that really, really annoyed me, though: there was this one stage where I had to do the water-skipping move, and it just wouldn't work. If Dixie was with me, I'd just float down slowly as if I were using her, when I wasn't. It made it impossible to get to a bonus barrel with both kongs, I had to let her get killed. Very annoying. I restarted 20 times before figuring out what the problem was. Gyah. How many times did I vote for DKC 2 (Which I haven't played?). DKC 3 gets nominated once and it gets up. I'm already like 75% through the game from when I picked it up over Christmas. I think I like DKC3 better than the others though. I really enjoyed tracking down the quest collectables and finding secrets when I first played iton my cousins SNES all those years ago. Maybe I'll finish it for the club. That water skipping move shits me the hell off. I still can't do it properly. Those secrets remain uncollected. It's gonna be awesome playing through this again. It'll be the first RGC I actually bust out a retro console for! This is my fault, isn't it? I never got 105%, I think that will be my goal this time. "Sorry guys, I gotta sit this one out!" I'm behind on other RGCs (like Blaster Master and Act Raiser), and I've already 105%'d this one before. You can 105% percent this game? I did not know that. Anyway, I'll be playing on SNES. I don't really have an old TV that I can put this game on at the moment. Well I do, but it's enormous and I can't really move it anywhere. Guess I'll have to use my remaining 800 points on it. Also, Dr. Finklestein should totally just forego this Game Club and play through DKC2!!!! Required gaming. You have to 103% it to access Super difficulty...and it's not easy to finish. Luckily for me I'm a bit of a game masochist. Too hard? No such thing! So once you put it on Super difficulty do you have to find all the secrets again or can you just run through the game? It's been a couple of years, but if memory serves, you have to 103% it to access the cheat menu, enter a password, then play through the game a second time. I would really like to sit down with this game tonight. I also need to keep going with Xenoblade though. Curses! I'm starting on the original DKC this weekend, since I've played very little of it. @ludist210 What? I thought you just had to get "103%" in under the time Cranky has on the scoreboard at the end of the game? Hmm, says you have to start a new game with the TUFST password input, then do everything you need to do to get 103%. But the TUFST makes it so there are no Kong barrels and no halfway barrels. Soooo, I'm just going to start my game like that. But the TUFST makes it so there are no Kong barrels and no halfway barrels.